The Roland VersaUV LEF-300 is the latest and greatest of our Roland VersaUV LEF series of flatbed printers. It offers the same brilliant color and direct printing capabilities on a vast array of materials, including three-dimensional items up to 3.94” thick, and now also enables printing larger items and higher quantities. Featuring a 30” print width, four print heads and two UV-LED lamps for faster curing, the Roland VersaUV LEF-300 significantly increases productivity and delivers stunning results. Print graphics with incredible detail and color on a virtually unlimited range of promotional products. Designed for flexibility, ECO-UV inks image beautifully and conform around the most complex corners and curves, allowing users to customize everything from gifts and novelties to industrial parts and product prototypes. ECO-UV ink options include high-density white ink for greater brilliance on clear or dark-colored materials and Gloss ink for gloss and matte finishes. Multiple layers of clear ink can be applied to simulate embossing and 3D textures, and the included VersaWorks Dual RIP software comes with 72 ready-to-use texture patterns. In order to maintain accurate high-quality printing, even during long production runs, the Roland VersaUV LEF-300 Flatbed Printer incorporates precision parts that are not susceptible to changes in temperature or humidity. To meet the needs of high-volume production and manufacturing facilities, the Roland VersaUV LEF-300 also includes an input/output system for integrating machine status lights and other assembly line tools – enabling scalable production with multiple Roland VersaUV LEF-300’s. A height sensor bar made with a non-magnetic material, for printing on magnetic items such as iPad covers, while the optional RotaPrint attachment enables users to print onto cylindrical objects. 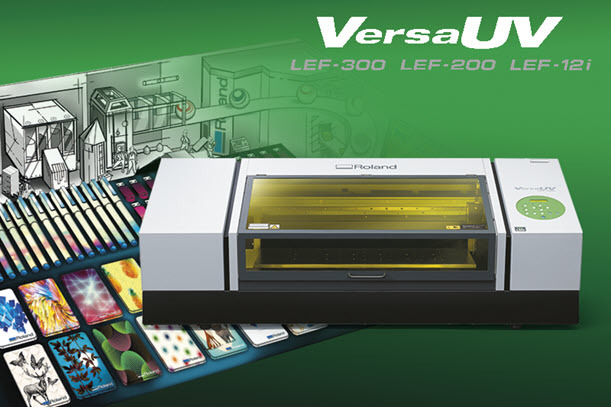 The Roland VersaUV LEF-300 features an optional on-board primer cartridge for priming objects quickly and conveniently on a selection of different media substrates. Users can easily prep an object for customization printing Primer ink directly from a file in VersaWorks Dual RIP before printing the full-color graphic. This makes adding graphics to challenging materials much more clean and efficient. When printing on 3D items, the Roland VersaUV LEF-300 features a height adjuster that automatically moves the flatbed printer table back and forth until it reaches the required height. This automatic function also ensures quality print production by maintaining an optimum distance between the print head and the material surface. Combine the Roland VersaUV LEF-300 with an optional BOFA air filtration system to ensure proper ventilation, while also functioning as a stand and storage unit for fixtures and supplies. The Roland VersaUV LEF-300 uses an LED for UV-curing that last up to ten times longer than conventional UV lamps and can be instantly switched on or off, giving the user true on-demand production without the typical warm-up time. In addition, the Roland VersaUV LEF-300 automatically enters a low-power mode when it is not used for an extended period of time. Printing around the most complex corners and curves, advanced Roland ECO-UV® inks enable printing on a vast array of shapes and surfaces. The Roland VersaUV LEF-300 also features an Automated Ink Circulation System that prevents ink pigments from settling in the ink lines for consistently brilliant image quality with a smooth consistency and density, even on long print runs. To ensure optimum print quality around the curvatures of objects, mist filters are incorporated in the LEF, catching the residual ink that mists when printing off the edge or curvature of a product. This cuts down on overspray and keeps the ink from settling on the printer’s internal components. Filters are designed to be easily replaceable by the end user. Printing white and CMYK onto bottles and cylindrical objects is an absolute snap with the new RotaPrint attachment for the Roland VersaUV LEF-300 flatbed printer. Simple to install and remove, it utilizes the Roland VersaUV LEF-300’s existing feed system and enables the Roland VersaUV LEF-300 to print cleanly and precisely onto a wide range of materials with a diameter between 1.6 to 3 inches (40 mm to 77 mm). With its sturdy build, RotaPrint is also consistently and reliably accurate, ensuring precise stepping during rotation. Acceptable Media Max: 31.5" x 14.2" x 3.94"
Dimensions: Width: 61.4", Depth: 37.6", Height: 22.7"
The Roland VersaUV LEF-300 makes it fast and easy to print on a wide range of materials to create unique products to ensure your business succeeds. We have additional Introduction and Training Videos for the Roland VersaUV LEF-300. Want to learn more about the Roland VersaUV LEF-300 and UV Printing? Download our Free VersaUV Printer Guide. Want to learn more about the Roland VersaUV LEF-300? Download the Roland VersaUV LEF-300 Brochure. The Roland VersaUV LEF-300 is the latest and greatest of our VersaUV LEF series of flatbed printers. It offers the same brilliant color and direct printing capabilities on a vast array of materials, including three-dimensional items up to 3.94” thick, and now also enables printing larger items and higher quantities. Featuring a 30” print width, four print heads and two UV-LED lamps for faster curing, the Roland VersaUV LEF-300 significantly increases productivity and delivers stunning results. In order to maintain accurate high-quality printing, even during long production runs, the Roland VersaUV LEF-300 Flatbed Printer incorporates precision parts that are not susceptible to changes in temperature or humidity. To meet the needs of high-volume production and manufacturing facilities, the Roland VersaUV LEF-300 also includes an input/output system for integrating machine status lights and other assembly line tools – enabling scalable production with multiple Roland VersaUV LEF-300’s. A height sensor bar made with non-magnetic material, for printing on magnetic items such as iPad covers, while the optional RotaPrint attachment enables users to print onto cylindrical objects. To ensure optimum print quality around the curvatures of objects, mist filters are incorporated in the Roland VersaUV LEF-300, catching the residual ink that mists when printing off the edge or curvature of a product. This cuts down on overspray and keeps the ink from settling on the printer’s internal components. Filters are designed to be easily replaceable by the end user. Printing white and CMYK onto bottles and cylindrical objects is an absolute snap with the new RotaPrint attachment for the VersaUV LEF-12i flatbed printer. Simple to install and remove, it utilizes the LEF-12i’s existing feed system and enables the Roland VersaUV LEF-300 to print cleanly and precisely onto a wide range of materials with a diameter between 1.6 to 3 inches (40 mm to 77 mm). With its sturdy build, RotaPrint is also consistently and reliably accurate, ensuring precise stepping during rotation. Accessories Power cord, RIP & PRINT MANAGEMENT SOFTWARE (Roland VersaWorks 6), user documentation, pad trays, etc.